The new and improved Linkwel G2 offers advancements in operations, maintenance, sanitation, durability, cycle time and over all versatility to the user. 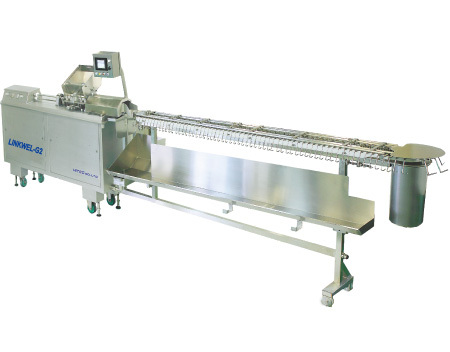 Production of up to 1,000 links of constant size and weight natural casing sausages per minute.Capabilities include fully automatic high-speed operation for artificial casing. With advance design of the Linkwel G2 the casing length has been extended by 10% allowing more output capacity per casing. A revolutionary breakthrough over the conventional looper horn which moves to hang product over hooks. 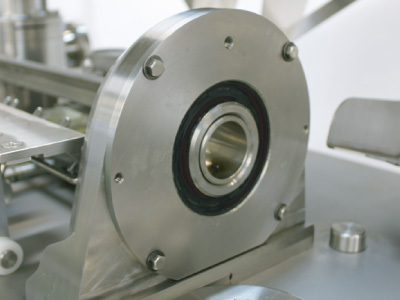 Our system allows precise hanging by simply allowing the product to "side" to the conveyor hooks without the need for more wear parts as on a looper system. With installing an optional water device, the process of tying the casings in the front and the tail has been eliminated. This device helps to increase both productivity and casing utilization. *Patent applied for "Water Device"
The metering pump offers increased durability compared to conventional ones. Our design offers excellent long term weight control with less necessary overhauls. A magnetic clutch starts and stops the pump precisely without slippage offering exact front ends and tails. Never have to concern about leaks. Direct drive from motor with timing belt brings fewer components and extended parts life. When necessary, replacing parts is done quickly and easily without the need to remove the entire twister assembly. Collagen Casing 3 pitches (28.6 mm , 1 1/8 in) through 32 pitches (304.8 mm, 12 in) or more. 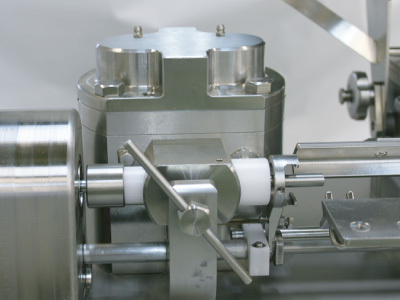 Cellulose Casing 3 pitches (28.6 mm , 1 1/8 in) through 32 pitches (304.8 mm, 12 in) or more. Natural Casing 3 pitches (28.6 mm , 1 1/8 in) through 20 pitches (190.5 mm, 7 1/2 in) or more. 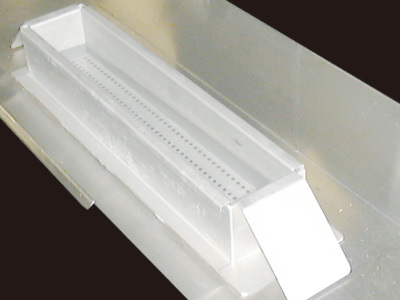 ※ Optional sanitary design hanging conveyor in 8ft or 10ft length available. 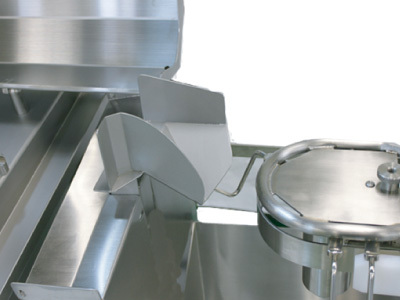 Sanitary servo conveyor made of round tubing for optimum sanitation. All components are removable without tool usage. No debris or dirt collection surfaces makes sanitation quick and thorough.